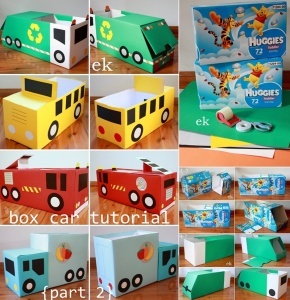 Mandy at Mandy’s Krafty Exploits came up with a brilliant idea to recycle a diaper box. 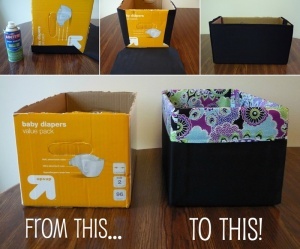 She covered the diaper box with canvas fabric in black and lined the edges with a printed fabric. This fabric lined bin can be used to store a multitude of things. 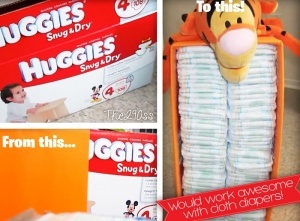 Bre at Average But Inspired has shared a clever way to upcycle a diaper box. 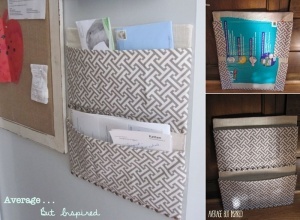 She used a combination of different kinds of adhesives and glues and created this wonderful no sew wall organizer with storage pockets by covering a diaper box’s pieces in fabric. 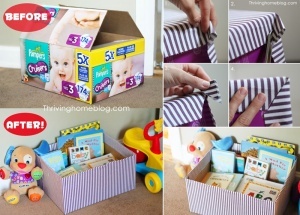 The 290ss Blog has shared a super cute way to make a diaper storage shelf from an old diaper box. You need to cover the box in a colored sheet matching a stuffed toy and then you have to hot glue the stuffed toy on top and voila! 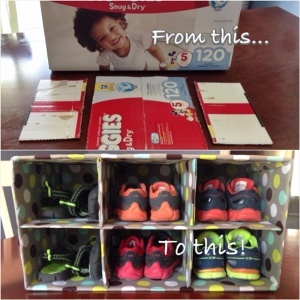 Sandy Britt via Pinterest has shared a fun way to recycle a diaper box and make a shoe cubby to store all those cute little pairs of shoes that must be lying on the floor of your child’s nursery. 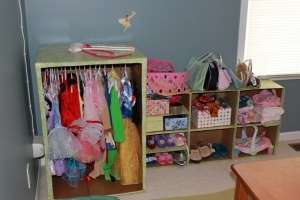 If your child has reached book reading age and you want a solution to store all the books in one place but can’t go for a big bookcase then this idea by Thriving Home Blog is worth giving a try to.